On Tuesday, April 4, Ruth Klüger, a survivor of the Holocaust, spoke at Franklin & Marshall about her experiences in Nazi Germany and the concentration camps she was deported to. Klüger read passages from her autobiography, Still Alive: A Holocaust Girlhood Remembered. In the book, Klüger first describes her childhood, specifically growing up surrounded by anti-semitism in Vienna, Austria, where she was born. While Austria claimed after the war that it had been invaded and occupied by Germany, in order to separate itself from Germany and to absolve the country of any responsibility for and complicity in the Holocaust, this rendering of history is, in fact, misleading. Nazi Germany annexed a willing Austria in March, 1938. At this time, Klüger remembers, her father showed her the new currency of the country; however, Klüger was never able to fully know her father. She had believed that he was killed at Auschwitz until she wrote Still Alive, at which point she learned that he was transported to Ukraine. To this day, Kluger does not know what happened to her father or how he died. In fact, Klüger, like others in her situation, still does not know what happened to her relatives or where and how they died. As a child, Klüger was not supposed to know about death or dying. She read a passage from her memoir in which she describes overhearing her family members talking about a cousin of hers, who was tortured, when he was a teenager. Klüger expressed that such horror stories were not unusual when she was growing up, in a country riddled with state sanctioned anti-semitism. Moreover, at this time, half of Vienna was forbidden to Jews. Klüger remembers hearing Nazi boys singing songs about Jewish blood in the streets. Klüger’s family was to be resettled in an all-Jewish shtetl, she said. They were deported to a ghetto in Czechoslovakia, which she considers to be the first of the three camps in which she was imprisoned. Klüger recounts the camp as an overcrowded place, where everyone wore a yellow star. At the concentration camp, Nazi officials divided people into groups, based on who they deemed would be useful to them in work camps and who would go directly to extermination camps. Klüger was sent to another work camp, the name of which she does not remember. 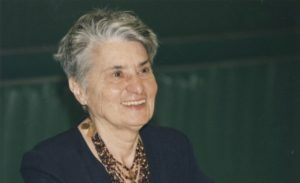 Klüger explained that she and other Holocaust survivors she knew felt a reluctance to remember names of camps; even her family didn’t remember where it was she was held. Klüger reflected that, “perhaps the ultimate luxury is being able to mourn every death.” She elaborated that, in the death camps, one got used to death because it occurred so often. Her grandmother died in prison. Once the doors opened in the suffocating freight car, Klüger and the other prisoners stepped out to get fresh air, but it was not much better in the death camp, where one could smell people’s dying bodies. Klüger could not cry because she did not want to attract attention. At the entrance to the death camp read, “labor liberates,” a statement Klüger described as murderously ironic. In her talk, Klüger said she identifies with certain aspects of the horror movie, Get Out, such as the paranoia, which she thinks was a surviving factor for her. It was helpful to be paranoid in Auschwitz, as the social order catches up with your delusions if you are paranoid. Her mother was paranoid until her death, many years later in the U.S.
At Auschwitz, people were once again selected, some to go to gas chambers and others to work camps. Klüger lied about her age, claiming to be fifteen instead of twelve, so that she could be with her mother and avoid the gas chamber. She was sent to a work camp. Still, there was always the fear of death; as Kluger expressed, she thought the grass would outlast her. She felt no comfort in the camp and was always thirsty, a feeling much worse than being always hungry since you can die faster from thirst. Once Auschwitz was liberated by the Soviets, Klüger immigrated to New York City. She received her PhD from Berkeley. She became a well-published author and professor. During her career as a professor, Klüger taught at both the University of California Irvine and Princeton University. Klüger remembered that, at Auschwitz, Jews said they had to survive so that they could write about what happened to them and educate others. At first, she did not write, since others already had, and she felt the story had already been told. It was not until her sixties that she decided to tell her story. Looking back on her book, Still Alive, twenty years later, Klüger said that people can change. She no longer feels as much anger towards Germany, a country which has learned from its past, so that “what is left of Nazi Germany is fringe.” Now, Klüger attested, “Germany is an outstretched hand in Europe.” Germany has let in one million refugees, while the U.S. capped its admittance of refugees at ten thousand, even before the new administration’s travel ban. Klüger concluded by remarking that Germany is leading Austria, the U.S., and other countries by far in this regard. Sophomore Sarah Frazer is a staff writer. Her email is sfrazer@fandm.edu.